Blurb: It’s the end of Year 12. Lucy’s looking for Shadow, the graffiti artist everyone talks about. Review: What did you accomplish last night? I ate too many brownies, did a bit of reading, and slept for a fulfilling eight hours. Then this morning I woke up and finished Graffiti Moon and felt like a schlub. Because guess what Ed, Leo, Dylan, Lucy, Jazz, and Daisy—the wonderfully funny and flawed characters in the book—accomplished last night? They only explored the entire city of Melbourne, learned about art and themselves, forgot and remembered birthdays, took part in many bathroom stall pep talk sessions, averted an attempted robbery, and, oh, they fell in love. 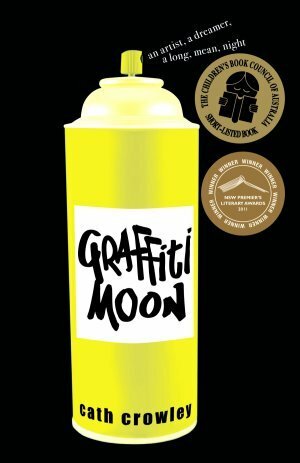 In Graffiti Moon the entire plot and heaps of character development occur in one night. One magical night. Everything about this book is so ridiculously clever. Lucy, a whipsmart glassblower whom I think most dreamer/reader types will relate to, is on a quest to find Shadow, an enigmatic and brilliant street artist. Unbeknownst to her, the group of boys she and her friends have decided to celebrate the night with includes Shadow and his partner Poet. The narration is first-person alternating POVs, a technique that works perfectly since we see things unroll from two distinct but intertwined perspectives. …and then I do know the truth. Then he clicks together, and I see him. His face is kind of lopsided for a second, like he’s trying to keep himself together, keep himself in the shape that he shows to the world, but he can’t do it anymore and everything in him is sliding out. The characters in Graffiti Moon are smart. I’ve always bemoaned the paucity of intelligent teens in the YA genre, but I think I’ve found my cure with Australian authors like Cath Crowley. They construct humorous books that remain tethered to reality; imperfect characters that still function at a high mental level; love stories smothered in beautiful truths. Blurb: Every time Bill Bryson walks out the door, memorable travel literature threatens to break out. His previous excursion along the Appalachian Trail resulted in the sublime national bestseller A Walk in the Woods. 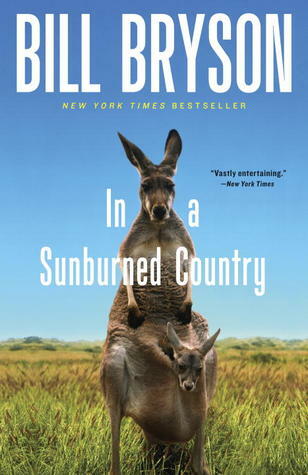 In A Sunburned Country is his report on what he found in an entirely different place: Australia, the country that doubles as a continent, and a place with the friendliest inhabitants, the hottest, driest weather, and the most peculiar and lethal wildlife to be found on the planet. The result is a deliciously funny, fact-filled, and adventurous performance by a writer who combines humor, wonder, and unflagging curiousity. 1. the Aborigine people have the oldest culture on Earth, probably dating to at least 40,000 years. They crossed the sea to Australia using god-knows what maritime technology at a time when Neanderthals still existed. Yet no one remembers this remarkable accomplishment. Indeed, not remembering the Aborigines is an Australian pastime and a dark spot on their otherwise congenial culture. 3. Australia is HUGE. Astoundingly large. And in addition to being a hulking continent/country/island hybrid land mass, it is empty. An immense void in the Pacific. 4. many explorers have gotten lost in the Outback, and desperately thirsty, have deigned to drink their own urine and the urine of their companions. Important lesson for any potential explorers: the salt in the urine will actually exacerbate your thirst. 5. Australia is the least wooded continent aside from Antarctica yet it is the world’s largest exporter of woodchips. Australians are very unfair in this way. They spend half of any conversation insisting that the country’s dangers are vastly overrated and that there’s nothing to worry about, and the other half telling you how six months ago their Uncle Bob was driving to Mudgee when a tiger snake slid out from under the dashboard and bit him on the groin, but that it’s okay now because he’s off the life support machine and they’ve discovered he can communicate with eye blinks. Reading one of Bill Bryson’s travelogues is always a fantastic time. You laugh, you learn, you marvel. He stuffs your head with useless trivia and reminds you how valuable our world and our fellow people are. I need to stop reading his books because I always finish and make haste to airline sites, researching plane prices for impossible journeys, adding another place to my lengthy Must-See-Before-Dead list. But I can’t stop. He’s perfect at what he does. Margo Lanagan’s electrifying stories take place in worlds not quite our own, and yet each one illuminates what it is to be human. They are stories of yearning for more, and learning to live with what you have. Stories that show the imprint love leaves on us all. If you think you don’t like short fiction, that a story can’t have the depth or impact of a novel, then you haven’t read Margo Lanagan. A writer this startling and this original doesn’t come along very often. So for anyone who likes to be surprised, touched, unsettled, intrigued, or scared senseless, prepare to be dazzled by what a master storyteller can do in a few short pages. 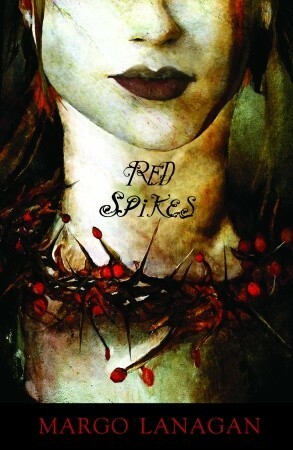 I don’t normally read short fiction, but my love for Margo Lanagan’s The Brides of Rollrock Island and my desire for something different encouraged me to pick up Red Spikes, a collection of ten short stories. Unfortunately, I couldn’t help but feel cheated as I read the stories because as soon as I’d connect with the character, develop a guess as to where the plot was going, or lose myself in Lanagan’s lurid and ambient settings, the story would end. Lanagan’s writing is beautiful and her ideas are so endlessly creative, so all I wanted while reading these stories was to see them fully realized as feature-length works. Though short stories are, by definition, short, these stories seemed exceptionally so. They are better defined as sparse, atmospheric vignettes, captivating but woefully incomplete. I was particularly disappointed with “Under Hell, Over Heaven,” my favorite of the collection, because it would have been an incredible novel. The idea is that a troop of kids living in Purgatory deliver souls to Heaven and Hell, hoping one day that their work will result in a promotion from Purgatory to heaven. The three realms of Heaven, Hell, and Purgatory are exquisitely imagined and described, but the story was too short to develop any long-term intrigue. Its premature ending left me unsatisfied. -“Baby Jane,” a portal story featuring childbirth in between fantasy realms. -“A Good Heart,” a medievalesque setting with focus on love and women’s choices and positions in such a society. -“Winkie,” a terrifying Boogeyman type story. -“Forever Upward,” a society where a colonizing force has taken away all the men and a little girl and the remaining women must appeal to their disappeared gods for help. Mostly, this collection made me hope that Lanagan is writing more novels. I suppose I can take solace in the fact that I have not yet read her award-winning novel Tender Morsels.